If you're planning a wedding and you want a one-of-a-kind atmosphere for your guests, you're going to want to chat with this week's featured vendor. 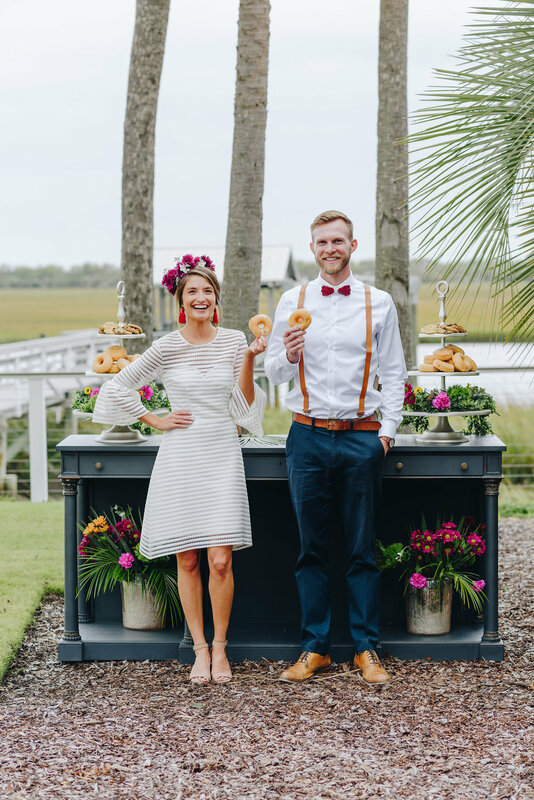 Carly Jones, owner of Adorn Charleston, started her rentals business in 2017 and is busy bringing her unique and vintage-inspired pieces to the Lowcountry wedding scene. Today, we're learning more about what brought her to entrepreneurship and why her adopted hometown of Charleston makes her happy. Interestingly enough, I never thought of myself as being in the wedding industry. I started out with a background in interior design and worked in the high end retail business for over 6 years. During those years, my mom and I did the decor for weddings of family and friends. I discovered my love for wedding decor and lounge set ups that truly make a wedding one of a kind! Know your worth and abilities. The more confident you are in yourself and your abilities, you will have more of a chance to succeed. I was not born in Charleston but I claim to be from here! What makes South Carolina special is the people you meet. Everyone is willing to lend a hand, and the scenery is not too shabby either! I am helping a dear friend of mine with her wedding in April and I cant wait to help her make her dream wedding happen!